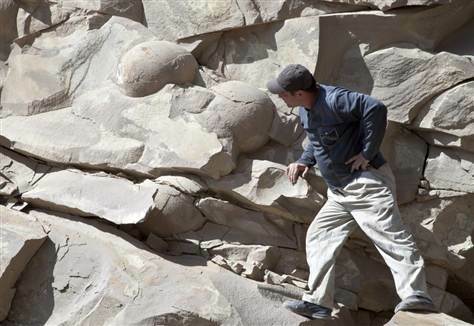 Geologists in Russia's volatile Chechnya region have discovered what they believe to be fossilized dinosaur eggs laid by one of the huge extinct reptiles that roamed the Earth more than 60 million years ago. "We've found about 40 eggs so far, the exact number has not been established," said Said-Emin Dzhabrailov, a geologist at the Chechen State University. "There could be many more laying under the ground." The find was uncovered when a construction crew was blasting through a hillside to build a road near the region's border with former Soviet Georgia in the Caucasus Mountains. Dzhabrailov said that the regional Chechen government, which is eager to shed the region's reputation for violence, is considering turning the area into a nature preserve and seeking to attract tourists. Federal forces fought two separatists wars between 1994-2001 in Chechnya, and an Islamist insurgency persists in the mostly Muslim region and surrounding provinces of Russia's North Caucasus. However, violence has declined under the strong-arm rule of Ramzan Kadyrov, whose multi-million dollar construction projects are aimed at raising the region's profile and boosting the tourism potential of the troubled area.